Having just returned from two weeks in Vietnam, I'm excited and ambitious about this three part posting of north, central and south. I'm also suffering serious withdrawal from the food. Matt and I have been doing many long weekend trips this year and while they are fun, they always leave me feeling cheated and guilty for cheating the destination. I wanted so much to spend more time in Vietnam so we squeezed in two weeks between school and work. Unfortunately, two weeks barely skims the surface because each region deserves at least two weeks each. And then there's that point in the trip when I start wondering if I should ever leave (cue existential crisis). We flew into Hanoi and worked our way south via buses, trains and planes. Immediately after stepping foot off the airport bus, I was captivated by the smells and sights of a city that so clearly revolves around food - cooking it, eating it, selling it, everywhere. Yes, I had come to the right place. So before even making it to the hotel, two pitstops were necessary. Oh banh mi, how I love thee. It's something I crave often, hunt for frequently, but rarely eat. So imagine my delight to find them on every street corner in Hanoi for $0.50. This is the perfect combination of flavors resulting from 100 years of French colonization. Succulent pork belly is combined with pâté, then topped with crunchy cucumbers, cilantro and carrots, and stuffed in a light and crusty baguette. And then there's THE dish...pho. We stopped at a little cafe for a bowl of pho that was probably considered average but was still delicious. The best part of pho is the broth, which looks clear and light on the surface, but packs a punch of flavor from hours of stewing beef bones, herbs and spices. Going from clean and organized streets of Singapore into the chaotic streets of old town Hanoi was like waking up from a dull dream and entering reality again. I felt a little groggy and confused at first but gradually embraced the new world and even started crossing those deathly streets with confidence. The best thing to do around old town is to wander, sit on one of those colorful plastic stools (being careful not to confuse what is a stool and what is a table), drink the local fresh beer for $0.25 each, and people watch. There is an intersection known commonly as bia hoi corner, which is typically filled with a lot of tourists drinking and eating fried cheese sticks (I don't know), and of course... tiger girls. One of my favorite dishes the entire trip was at Bun Bo Nam Bo, a super casual restaurant that only serves this one dish, called bun bo nam bo. Take a seat anywhere, indicate how many you want with your hand and it quickly arrives. Bun bo nam bo is a big bowl of rice noodles, stir-fried beef, and the usual condiments of raw vegetables, fried onions and peanuts. 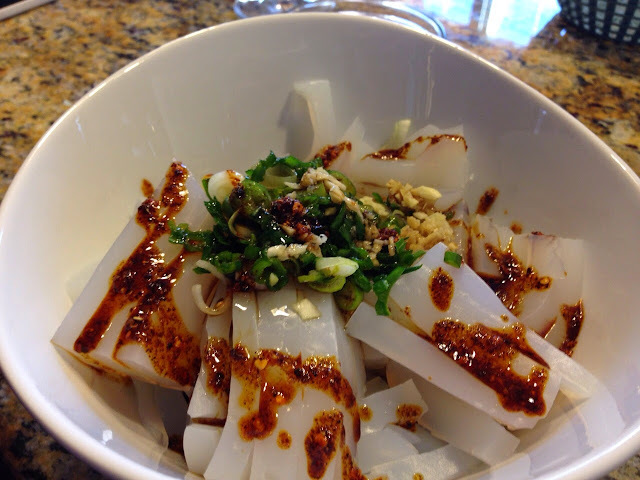 There is a light sauce of fish sauce, sugar and chili that brings the noodles to life. Vietnam is the perfect place for local street food lovers as the food in my opinion is generally pretty safe and clean. Vendors tend to specialize in one or two things with signs posted, so it's important to know the names of the common dishes, as confusing as they can be to memorize. I was searching for bun cha as soon as I landed and stumbled upon a street outlet to have it for lunch one day. Bun cha is a dish of grilled fatty pork, rice noodles, dipping sauce and fresh herbs. Everything is served separately leaving many choices on how to have it. I enjoyed taking big clumps of rice noodles letting them soak up the broth. We also checked out two very good and proper Vietnamese restaurants with a wide menu selection: Quan An Ngon and Yin and Yang. Feasting at Ying and Yang...is this enough food? After Hanoi we went on to Halong Bay for a night on a junk boat. Halong Bay is one of those things that everyone must do in Vietnam but is forced to give in to organized tours that all look the same but charge different prices. We went with an Imperial Junk boat with Vietnam Insolite Tours for $99pp and I liked it. I mean at the end of the day it's a boat, but they had good service, a lot of food and relatively clean rooms with showers and a/c. We had a day of sunshine to go sunbathing on the deck and kayaking in the bay. The second day was rainy but I thought that the rain made the whole place more beautiful and mystical. Over 1600 individual islets means you can really get lost and feel alone, forgetting that there are thousands of other tourists there too. Of course no travel day is complete without an unnecessary amount of food, and they fed us well on the boat. Final stop before heading south was Ninh Binh for a night. We took a local bus from Halong Bay to Ninh Binh and obviously got ripped off on the bus tickets, but it was the only option. Ninh Binh is a small town south of Hanoi and close to rice paddies and the limestone karsts of Tam Coc. There are organized tours but it's more fun to cycle the ~10K to Tam Coc through villages and and farms. This was a welcome sight after spending the previous 5 days surrounded by tourists. It was a little sad saying goodbye to the Northern Vietnam and there are so many other places I would have loved to see. Originally we planned to go to Sapa for 3 night (2 nights being on overnight trains), but it all ended up being too rushed. There wouldn't have had enough time to explore and embrace the local pace of life. Onwards to Hoi An for the next few days!